Casa Boa Vista is a large luxury family villa with unspoilt countryside to the rear and outstanding views. You really will relax in minutes, not days. It has 4 large bedrooms, 4 bathrooms and comfortably sleeps 8+2 using one portable cot and one portable bed. It has its own 10m x 5m heated pool, aircon, fast WiFi, wonderful TV channels including BBC/ITV, sports and movies. excellent games room with 8ft pool table, ping pong, tabletop footbal, step machine, vintage arcade machine, darts and many toys (including a Wendy House) for young children. All surrounded by beautiful garden in half acre plot. Plentiful off road parking. Only 20/25 mins from Faro airport. Excellent bistro restaurant only 800m from villa. Supermarkets/restaurants within 10 mins. Beaches, beach islands, golf, excellent shopping and other attractions only 15+ mins drive away. 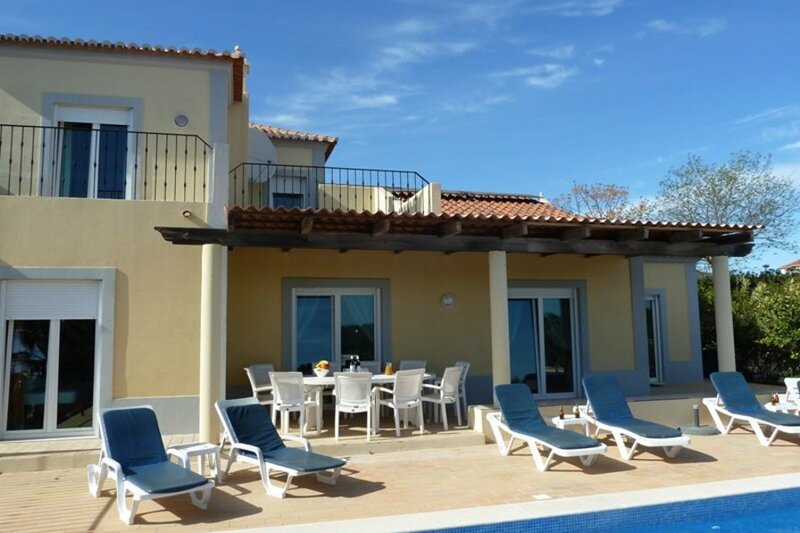 Casa Boa Vista a has its own south facing 10m x 5m heated pool at rear of villa with night lights and roman end for easy access. All surrounded by large pool terrace with padded loungers, tables and chairs with some deep shade for hotter months. Pool heating is by electric heatpump ensuring good temperature whenever you visit. Aircon (cool and warm) provided. Fast WiFi with unlimited downloading is also FREE. Superb garden surrounds with lemon, satsuma, plam, olive trees and amazing Algarvean planting. The garden also has a large boules area with seating, a large BBQ, table/chairs and solar lighting for al fresco dining. The villa backs onto unspoilt countryside with superb views. The villa is situated only 2.5 miles outside the small village of Moncarapacho, close to Estoi, Quelfes and Olhao, approx. 20 mins from Faro airport in the very beautiful unspoilt Eastern Algarve. INCLUSIVE PRICE - NO HIDDEN EXTRAS. Price includes: Heated pool, aircon, fast fast Wifi, excellent range of TV channels. All linen/towels (except for cot linen), up to 8 pool towels, weekly maid service and linen change. Also includes services of English/French/Portuguese speaking local manager who will meet you soon after arrival at the villa and remain on call throughout your holiday. There are 4 large bedrooms (2 kingsize ensuites and 2 twin rooms) There are 3 fully tiled luxurious bath/shower rooms all with bath, shower, bidet and wash hand basins and a further shower room with toilet and basin 2 bathrooms are ensuite. All bedrooms have extensive fitted cupboards and there are 2 digital safes fitted in the villa. The master en-suite bedroom on the first floor has a corner bath and its own furnished terrace where you can enjoy wonderful views. You will fight over this one!! The kitchen is exceptionally well equipped with everything you could wish for including a mortar and pestle! Lots of melamine items to reduce your stress levels for outside eating if you wish to use. But most important is the additional fridge in the utility room to keep the beers and wine cold!! The villa enjoys PRIME location with the garden backing onto protected land with stunning views of unspoilt countryside. Set amongst other luxury villas, all with plot sizes minimum half an acre. The surrounding area is rural and totally unspoilt and known for its extensive citrus and almond groves. However you are only 20 mins from Faro airport and only 30 minutes away from major Central Algarve attractions - if you can remover yourself away from the pool. This really is a superb location to enjoy beach and golf holidays .For golfers this is paradise. There are five golf courses all within 20+ mins, including Benamor, the championship Quinta de Cima golf course and sister club Ria - named in the 2004/05 Peugeot Golf Guide as the Best Golf Courses in Portugal. The brand new Monte Rei course is only 25 mins away. There are a further 5 golf courses close by approx 25-30 mins with 5 just over the border into Spain at Ayamonte. Just a few minutes away, outside Moncarapacho there is an excellent 9 hole par 3 course, also with putting green for the whole family to enjoy. There are some truly glorious beaches and beach islands nearby, many which are accessed by small boat/train (great fun for all the family), the closest being at Fuseta 6 miles away. Lots of info on local beaches, places to visit etc in the Welcome Book in the villa. There are wonderful island beaches in every direction and trips to enjoy in the mountains. The nearest village of Moncarapacho is 2.5 miles, with supermarket, 2 mini markets, cash machines, petrol station, dentist, doctors, pharmacy, post office, bars, some excellent restaurants, cyber cafes and other local shops. Not to be overlooked is an excellent inexpensive bistro restaurant just 800m from the villa, a gentle 12 min walk or 2 mins by car where guests go time after time. Within a few kms is the town of Olhao with many hypermarkets for best shopping, its fishing port, wonderful fish/veg markets, many fine fish restaurants, numerous fast food restaurants, upmarket shopping with boats to islands. Come and see and feel the difference - explore this very beautiful, unspoilt and inexpensive part of the Algarve. Car hire essential and happy to provide recommendations. The villa is within easy distance of Tavira (regarded as the loveliest town in the Algarve), Estoi (with its Rococo palace recently developed into a Poussada and Roman villa ruins), Olhao (fishing port, markets, shopping and excellent fish restaurants), Vila Real (16th century town on the Spanish border) and much much more. You are only 10 minutes away from accessing the Ria Formosa Park with flamingoes in cool weather and famous Portuguese water dogs with webbed feet. From Tavira, Olhao, Fusetta and Cabanas you can travel by small boat to many truly superb offshore island beaches. Seville can be reached within 2 hours, Cordoba is 2 hrs further on, , Lisbon is approximately 2.5 hours away. The roads and motorways are excellent. Alternatively within 30 mins driving west you can access major central Algarve towns and attractions .... or you could just chill, relax around the pool and enjoy doing absolutely nothing - as so many of our guests do !! For those with quieter tastes the nearby Ria Formosa National Park offers excellent walks, extensive beaches and fantastic birdwatching (feathered variety)!!. There are some really lovely places to visit - you will not be disappointed. This is a truly unspoilt part of the Algarve. Eating out on wonderful local fish meat and wine is still surprisingly inexpensive. Why not try it for a change. THE REAL PORTUGAL !! See reviews from guests - they love it! !